Sandeep Pulusani Wins Event #44: $3,000 No-Limit Hold'em! After 3 days of all ins, bad beats and aces on the river, Sandeep Pulusani took down Event #44: $3,000 No-Limit Hold'em for his first gold bracelet and $592,684. Pulusani started the day fourth in chips and remained relatively quiet. Even though he started heads up play with an 8:1 chip deficit, his game took on a new dimension and he dominated play throughout the battle until he claimed victory. The road to the final table was littered with notables making the money including: Randy Lew (113th), Lauren Kling (112th), Sorel Mizzi (90th), Barth Hanson (88th), Eddy Sabat (39th) and Matt Marafioti (23rd). It took about five hours to narrow the field from the 22 players that started the day to the official final table of nine. All eyes were on Jason Mercier when play began, as he chipped up early and was building a healthy stack. He ended up being eliminated 16th in one of the most memorable hands of the tournament. All the money went in on the turn when Mercier had a full house only to see it bettered when an ace fell on the river. Just 12 hands into the final table, the first player, Phillippe Vert, was eliminated in 9th place, when for the second time during the day, a two-outer ace came on the river for a huge pot. The next player to go was Pedro Rios in 8th place. Rios spent the whole day as a short stack but had some double ups in key places to get to the final table. Nam Le was eliminated in 7th place when a true cooler hand transpired. Action folded around to Le in the small blind who woke up to find kings and Niall Farrell looked down at aces from the big. Farrell was also responsible for the elimination of Mark Teltscher in 6th place, when Teltscher’s two overs couldn’t win a coin flip against the pair of Farrell. The Day 1 chipleader, Zo Karim, was our 5th-place finisher. Karim accumulated a lot of chips early but wasn’t able to get momentum on his side later in the day, when it really mattered. Martin Hanowski lost a flip to Niall Farrell for over 2/3 of the chips in play and left him with less than 10 big blinds. That would set him up for a 4th-place finish just a few hands later. Michael Rocco was the big stack for most of the day heading into the final table but he never seemed to get anything going while on the main stage. He was eliminated in 3rd place when his sixes failed to improve against Farrell’s kings. The final elimination of the night came when Niall Farrell lost a few key all ins and Pulusani paired his kicker on an ace versus ace hand. Now that Pulusani has claimed his bracelet, our coverage here is complete. Keep your browser on PokerNews.com for all the latest news and tournament coverage from the 2013 World Series of Poker. Good night from Las Vegas! 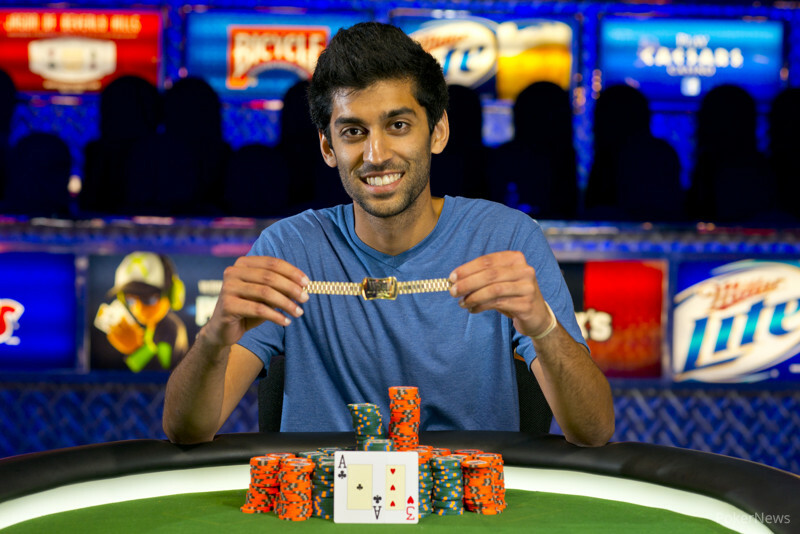 Hand #181: Sandeep Pulusani raised to 200,000 and Niall Farrell went all in. Pulusani called and the hands were tabled. Many times this hand would chop but the board was kind to Pulusani when a three came on the flop. The board read and Pulusani took the pot and eliminated Farrell in 2nd Place. 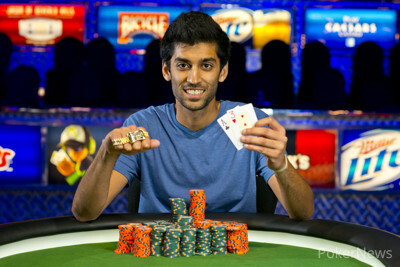 Hand #179- Sandeep Pulusani raised to 200,000, and Niall Farrell reraised it to 500,000. Pulusani then four bet it to one million exactly, and Farrell moved all in. Pulusani quickly folded, and Farrell retook the chip lead. Hand #180- Farrell made it 200,000, and Pulusani reraised to 500,000. Farrell asked Pulusani how much he had behind, and when he got the number, four million, Farrell moved all in. Pulusani called. Pulusani was well out in front, but short of an ace coming, the flop was as bad as he could see, coming . According to the PokerNews odds calculator, Farrell was actually the favorite now, as he would win 54% of the time. Farrell could catch an ace, five, or heart to win the hand, but the turn was the . Pulusani was looking to fade it one more time, and the river brought the other black jack, the . After winning that hand, Pulusani has a huge lead of eight million chips. Hand #174: Niall Farrell folded to Sandeep Pulusani. Hand #175: Pulusani raised to 200,000 and Farrell made the call. Farrell check called Pulusani's bet of 150,000 on the flop. Farrell checked the turn and Pulusani bet 300,000. Farrell called and then came the river. Farrell bet out and Pulusani folded. Hand #176: Farrell raised to 200,000 and Pulasani folded. Hand #177: Pulusani raised to 200,000 and Farrell folded. Hand #178: Farrell raised to 200,000 and Pulusani called. Pulusani checked the flop and Farrell bet 200,000. Pulusani called and checked the turn. Farrell checked behind and the river was dealt. Both players checked and Pulusani won the pot with . Hand #172- Sandeep Pulusani gets a walk in the big blind. Hand #173- Pulusani made it 200,000 to go on the button, and Farrell repopped it to 480,000. Pulusani moved all in for 2.6 million, and Farrell immediately asked for a count. When he got it, he made the call. The flop came , and Pulusani stayed out in front. The on the turn meant that Farrell could only win with a king or a queen. The river was paint, but it was one of the only cards that wouldn't help him, as the came. The stacks were broken down, and Pulusani jumped up to 5.2 million, while Farrell dropped to 4.4 million. 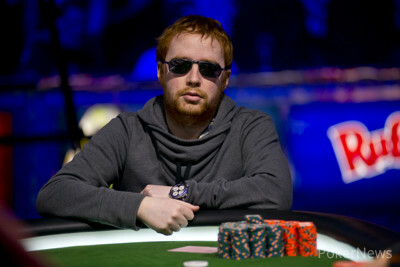 Hand #166: Niall Farrell raised to 160,000 and Sandeep Pulusani folded. Hand #167: Pulusani raised to 160,000 and Farrell reraised to 400,000. Pulusani made the call and both players checked the flop. Farrell bet 365,000 on the turn and Pulusani folded. Hand #168: Farrell raised to 160,000 and Pulusani made the call. Pulusani checked the flop and Farrell bets 160,000. Pulusani made the call and the turn was dealt. Pulusani checked and Farrell bet 255,000. Pulusani folded and Farrell raked the pot. Hand #169: Pulusani raised to 200,000 and Farrell folded. Hand #170: Farrell raised to 200,00 and Pulusani folded. Hand #171: Pulusani raised to 200,000 and Farrell folded. We have just started level 31, and it will be the last one of the night. If a winner isn't decided in an hour, the two will come back tomorrow to play out to a winner then. Hand #161- Sandeep Pulusani raised to 160,000 from the button, and Niall Farrell reraised it to 380,000. Pulusani folded, and Farrell took down the pot. Hand #162- Farrell made it 160,000 to go, and Pulusani made it 400,000 from the big blind. Farrell folded. Hand #163- Pulusani raised to 160,000, and Farrell made the call. The flop ran down , and both players checked. The hit the turn, and Farrell tossed out 160,000. Pulusani folded, and the pot went Harrell's way. Hand #164- Farrell made it 160,000 to go from the button, and Pulusani made the call. The flop came , and Pulusani checked to Farrell, who bet 160,000. Pulusani folded, and Farrell took it down. Hand #165- Pulusani made it 160,000, and Farrell called. was the flop, and both players checked. The turn was the , and Farrell fired out 160,000. Pulusani made it 400,000 to go, and Farrell folded.